Don't get me wrong, we need to learn from our past, especially our past mistakes. You can learn from history and use it to come up with new ideas, not just re-apply the old ones. Even if something had a certain outcome a year ago, the context may be radically different today and that will make the outcome radically different. Basically you have to respect history when creating your future but you shouldn't obsess about it. Working like this is a scary idea for most. It's scary because we are afraid of the unknown, and the future is unknown territory. I think this is one of the reasons we try to project the past onto the future. We try to minimize variations, completely ignoring that we have a huge variable called 'the world' which we can't control. Here at tretton37 we understand this, and that's why it's so important for us to continue questioning and re-evaluating our approach and ideas – not falling into the trap of "That's how it's always been". With this in mind, we explicitly chose "Challenge the World" as one of our core values. By challenging notions of what we can and can't do, we continue improving and innovating ourselves. It allows us to try new things and uncover new ways of nurturing people, teams, software and business. I'm not saying that we should question everything all the time. I'm saying that we need to understand the "Why" and "Why not" of the things we do and ideas we have. If either of those reasons change or we don't agree with them, we have justification in challenging that idea. Since we carefully evaluate the reasons behind our ideas, we feel secure with this type of controlled innovation. 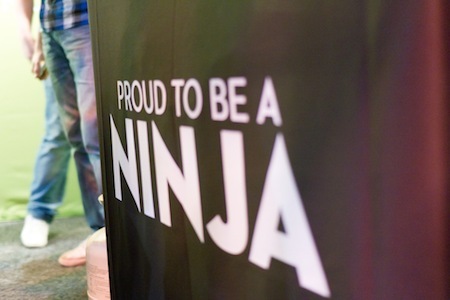 We feel confident in calling our company tretton37 and ourselves ninjas. Because why shouldn't we? Some may say we don't take our work seriously but our opinion is that being serious and boring are two separate things. Historically they go hand in hand, but why not separate them? Can't we have a bit of fun while developing serious software? We take our profession very seriously – we just don't feel that we have to be boring in order to do so. It was also quite a leap of faith for us to create a high quality and affordable conference. When we couldn't see the reason for why there shouldn't be one, we challenged the notion of the huge, classic conferences. Does it have to be expensive? Can we make it affordable, awesome and high quality? We thought we could and we think that we succeeded. These are only some examples of how we've challenged historical notions in our industry and we are by no means intending to stop.